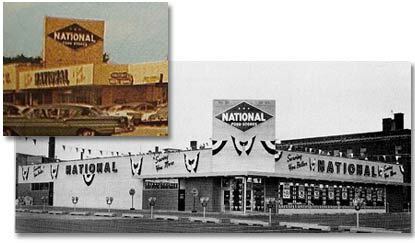 National itself was acquired by Loblaw Companies of Canada in 1955, and stores continued to operate under the National and Loblaw names. Stores also operated under the “Big D” banner. in 1964, the chain was operating all over the Midwest, the South, and the Great Plains. In the 1970s, Loblaw started divesting unprofitable stores, starting with 250 Chicago, Syracuse, and California stores in 1976. Indianapolis was sold in 1982, Minneapolis in 1983, and all remaining U.S. assets by 1995. St. Louis and New Orleans were the last regions to be sold. Loblaw’s is still an active retailer in Canada, operating stores under its own names as well as under the Zehr’s, Fortino’s, and Atlantic Superstores banners.